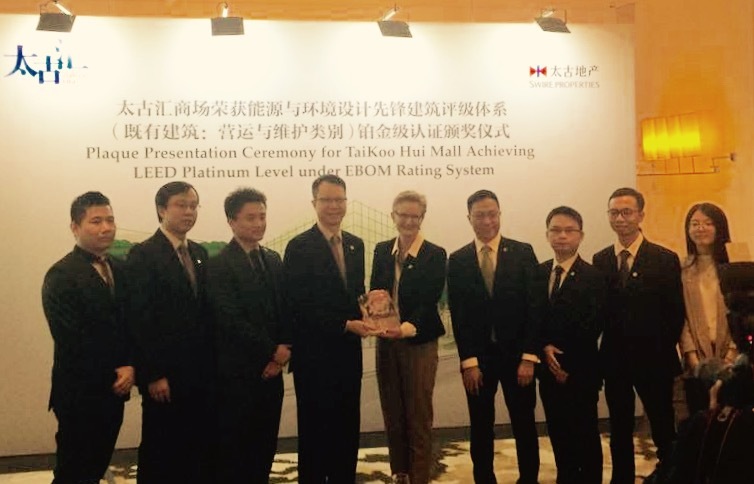 The Taikoo Hui Mall project in the Tianhe area of Guangzhou, China, recently achieved LEED Platinum status under LEED O+M: Existing Buildings. Sarah Alexander, Vice President, Certification, at GBCI, and Nellie Cheng, director of USGBC global market development, attended the ceremony. In 2012, both office towers in TaiKoo Hui achieved LEED Gold certification under LEED 2009 BD+C. The mall project, which encompasses 1,291,830 square feet, has now certified at the Platinum level. The owner of the building, Swire Properties, focuses on the environmental performance of its development and incorporates sustainable measures throughout a building’s life cycle, from planning and design to operation and maintenance. By the end of 2016, Swire Properties had 12 LEED-certified buildings.